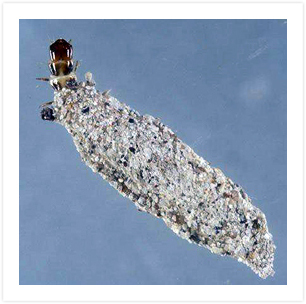 The plaster bagworm is a small larva that creates a case from silk and debris, like soil, lint and paint fragments to help camouflage the case. This protects it from predators as it matures inside. Plaster bagworms are also known by the name household casebearer. Plaster bagworms are household pests as they feed on wool and silk. They will eat the webs of spiders as well. The plaster bagworms can be identified by the cases they build. They resemble pumpkin seeds in that they are wide in the middle and tapered on the ends. This allows the larva to turn around inside the case. These cases are easily seen on light-colored walls and can be found mainly in closets. Plaster bagworms may also be found near baseboards, under chairs and on the edges of rugs. 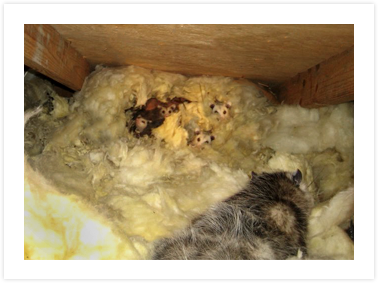 These pests are typically found in the southeastern region of the US. Plaster bagworm moths are small and gray, with distinct dark spots and long, gray hairs on their hindwings. The adult moths of the species do not appear to feed. The female moths will deposit up to 200 tiny, light-blue eggs in a hidden area to keep them safe while they mature. Once the larvae hatch, they spin a case of silk and coat it with debris to protect them. The plaster bagworms will travel with the case dragging behind them as they seek out food. These insects will pupate inside the case. Keeping your home free of spider webs and cobwebs can help control plaster bagworms. Store your clothing only after it has been cleaned and inspect your closet regularly, especially where items are stored for long periods of time. Plaster bagworms will only feed on the fibers of silk and wool. They do not eat cotton fibers.